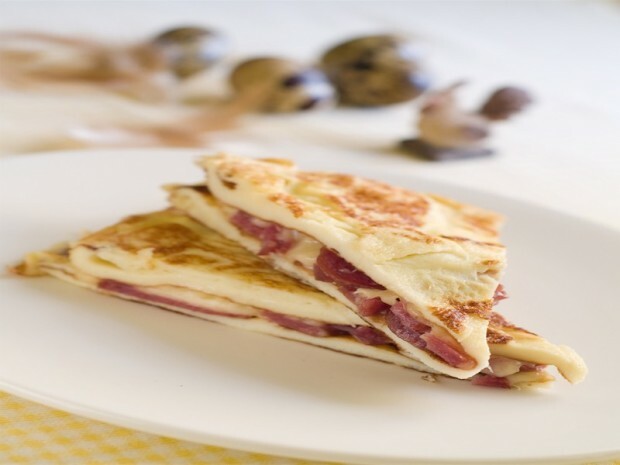 One thing I constantly missed when I started the Dukan Diet was quesadillas. I used to eat them all the time and just couldn’t find something that replaced them until I started making eggs crepes. At first I just rolled them up with low fat cheese or protein, but then I realized that I could recreate my beloved quesadilla using two egg crepes and any filling of my choice. This one is stuffed with low fat mozzarella and lean Canadian Bacon, but you can use anything you like, including veggies in the Cruise phase and beyond. 1. Scramble the egg white and whole together with salt and pepper. 2. Heat a non stick pan over medium heat and spray with cooking spray. Add to the pan and turn/twist the pan to evenly and thinly distribute the egg throughout the pan. 3. Cook for about 2 minutes until it bubbles and the top begins to cook through. Flip over. 4. Add the cheese and Canadian bacon and fold the crepe in half to cover the cheese and bacon. Cook until the cheese melts. Cut into triangles and serve. Is there a limit for how much salt I can eat?